I’ve never seen whales in the ocean before and I wasn’t about to miss the opportunity on my first trip to San Diego. 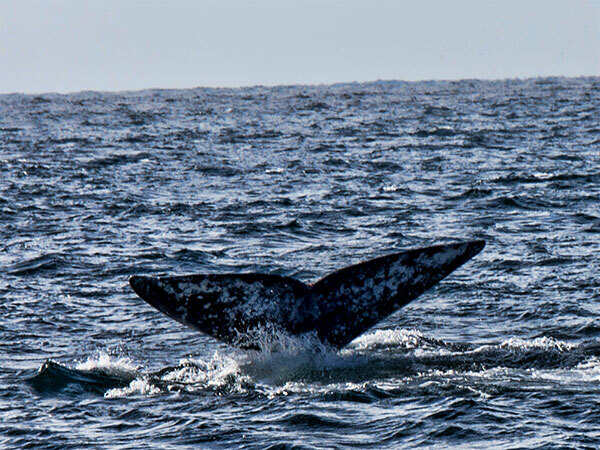 In the winter months there are mostly gray whales migrating South, and in the summer there are blue whales. If you get lucky there are a variety of other species around including killer whales but they are less common. 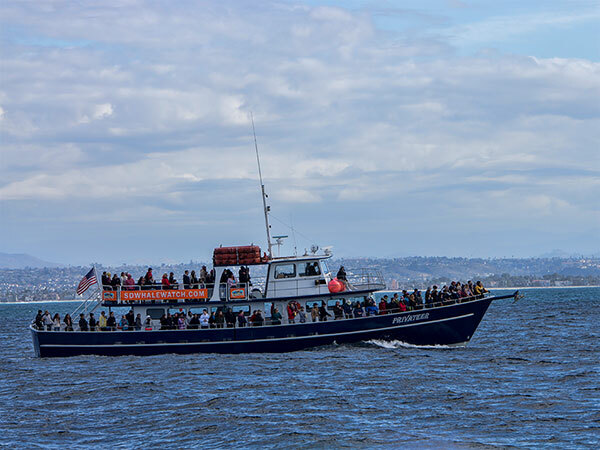 Being a budget-minded traveler with a variety of whale watching tour companies in San Diego to chose from, I ended up finding one that had a Groupon for over 50% off the regular rate and booked a 4 1/2 hour tour. 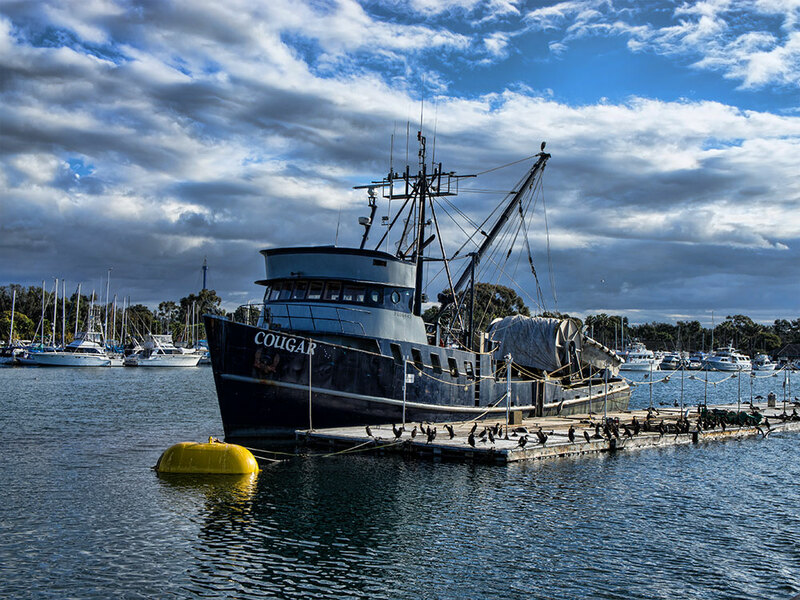 The boat would depart from Mission Bay and head out into the cold pacific ocean hunting down whales for my amusement.. sounded like a great time! Side Note: Most companies also offer 8-hour tours that go further. Upon arrival we had to pay an extra “fuel” fee that hadn’t been previously mentioned, but whatever… I was still anxious to get out on the water and see some whales! The tour was sold out and we had about 50 people on board. 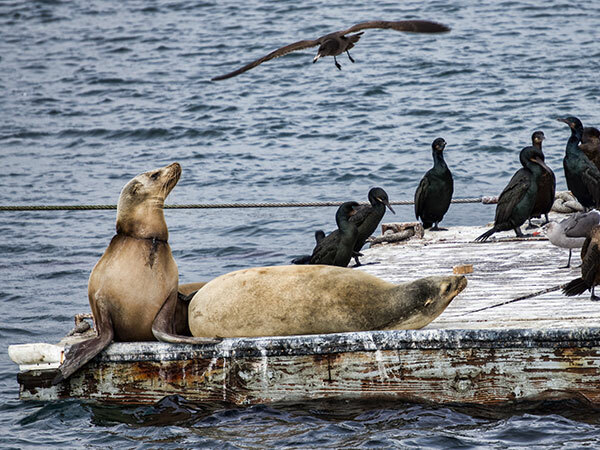 As we took off from the cove there were birds scattered all about, the sun was shining and everyone was excited. After only about 30 minutes on the water our captain and his helpers spotted 2 gray whales and we began following them. 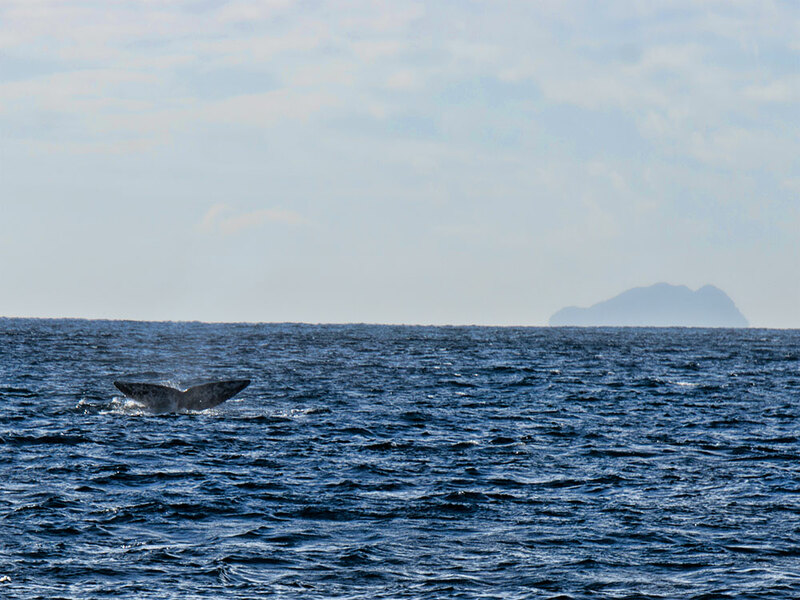 The whales only breach the surface once every few minutes and were a large distance away which made it quite exhausting to get a glimpse of them. 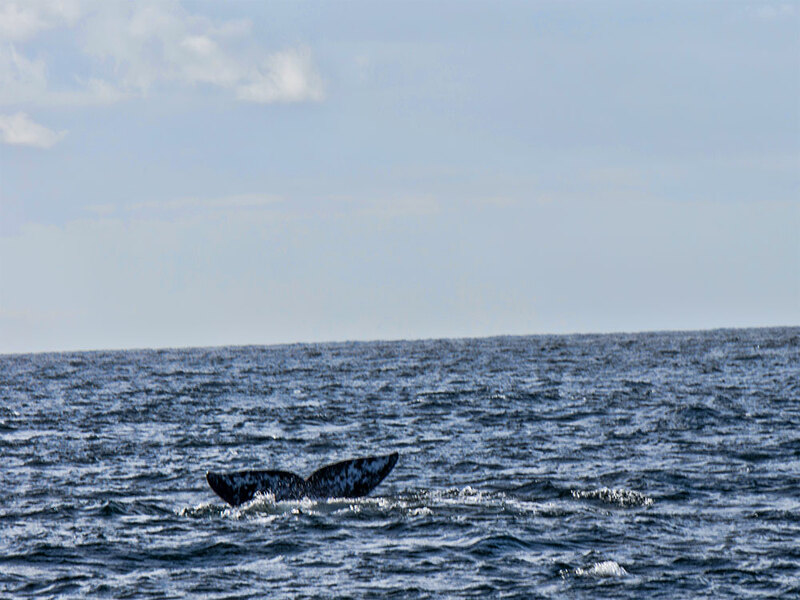 The tour operator’s website has pictures online showing the whales only a few feet from the boat so this is what I had been hoping to see. Instead we never got closer than 300-400 yards from them and were told this distance was some kind of law to protect them (oddly this is never mentioned on the websites). And taking photos? I’ll go ahead and call it mission impossible without an extra large zoom lens and cat-like reflexes. 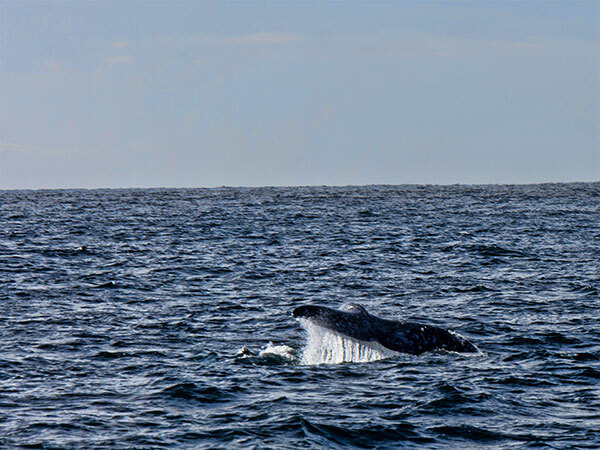 After just about 10-15 minutes of finding the first 2 whales we abandoned the chase and moved on. 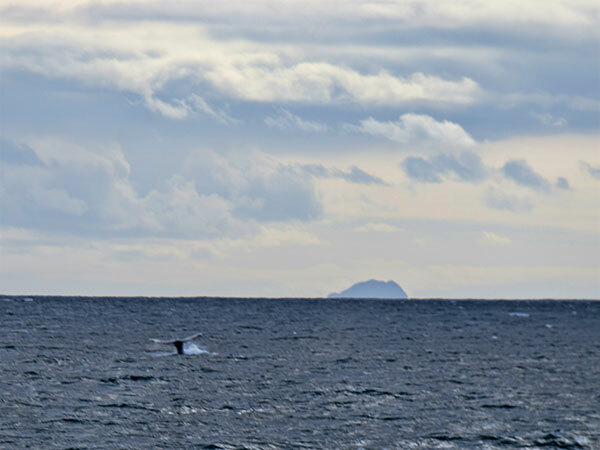 It was about another 2 uneventful hours before we saw another group of whales and again, never got closer than 2-3 football fields and left after just a few minutes of following them. 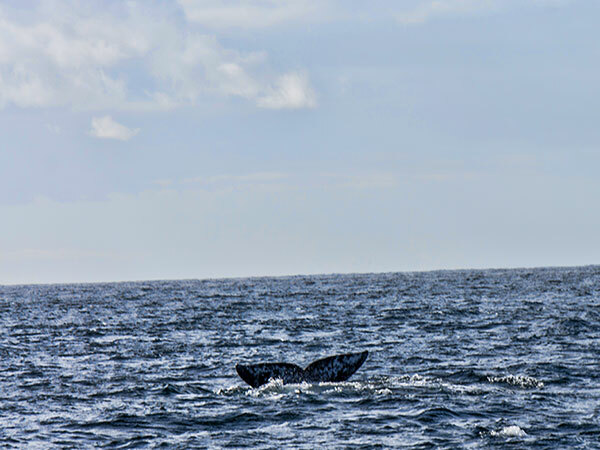 In the full 4.5 hour trip we saw 3 separate groups of whales. Keep in mind these photos were shot with a large zoom lens and not your standard point and shoot camera or 18-55 mm kit lens and are the only ones I got the entire trip. 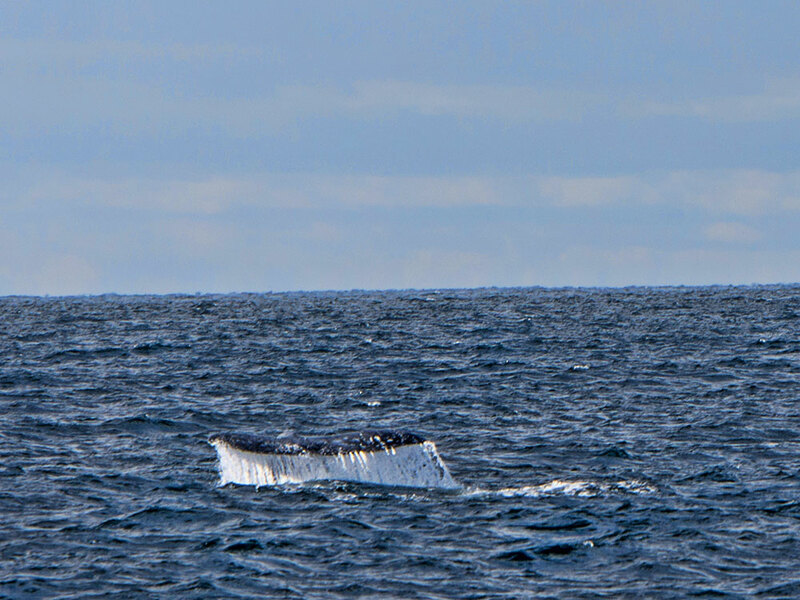 After leaving the second group of whales my legs were sore and fingers freezing from all the standing and waiting to catch a good picture. The sun had been swallowed by clouds, it was very windy once we left the shore and now there was a light drizzle of water coming down. 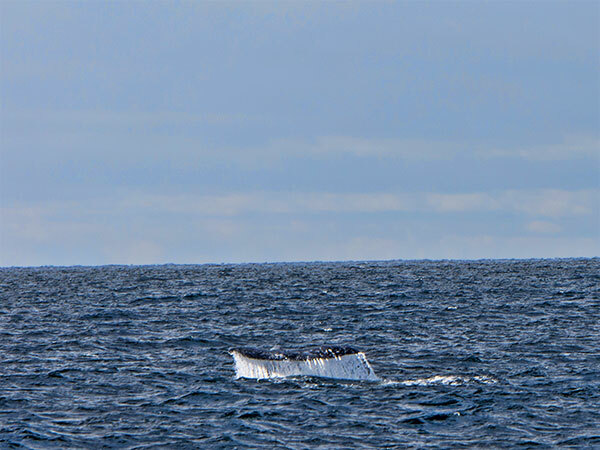 I was a bit frustrated to say the least and gave up trying to stay alert and ready on instant notice of spotting more whales. It’s a good thing I did too because we didn’t see more until the very end of the trip. 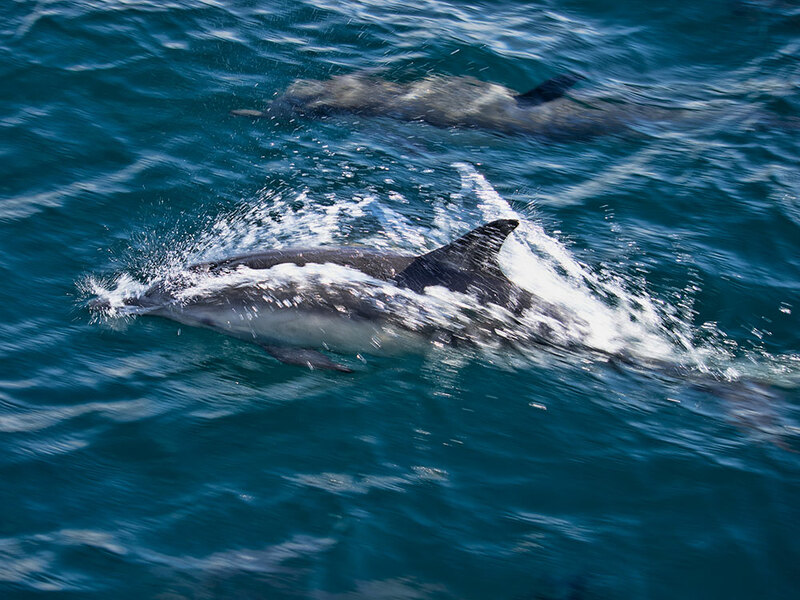 But along the way we were followed by quite a few dolphins that kept us somewhat entertained as they swam right up next to the boat. 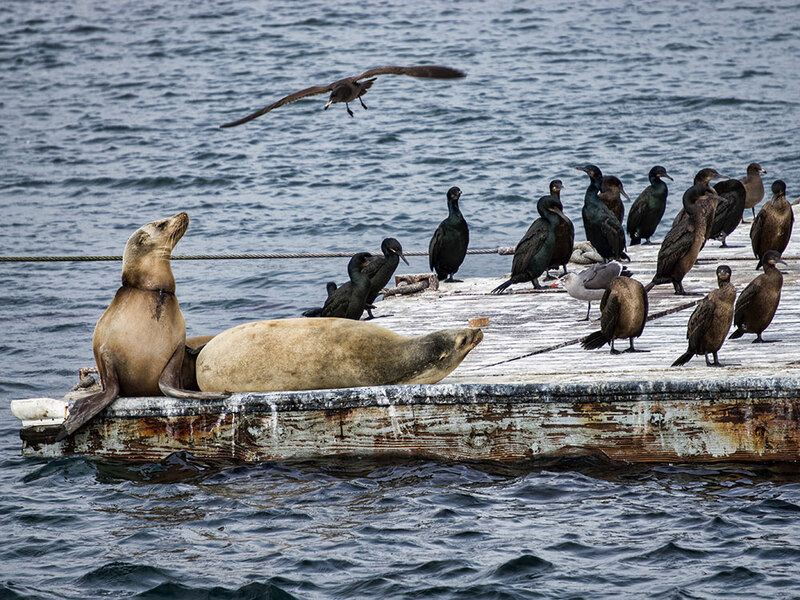 While arriving back at land some sea lions were relaxing on floating docks with the birds. 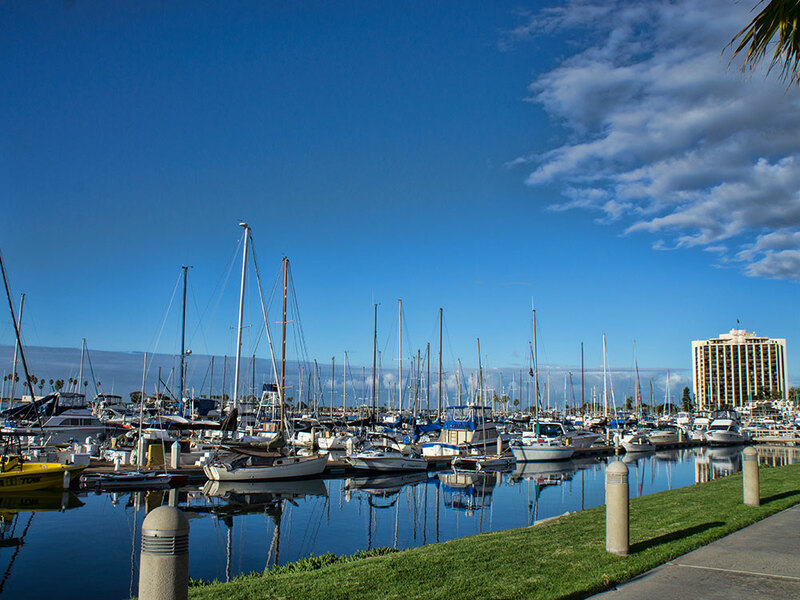 While I went in with high expectations and had some disappointments overall whale watching can be a fun and exciting day-trip while visiting the San Diego area. I’ve read of others who saw incredible whale breaches, hunts and other things… when trying to view any wild creatures results will vary. Don’t expect to see the whales at close range. Wear warm clothes, bring gloves & a hat to keep warm. It’s cold and windy out there. If you don’t have a large zoom and aren’t hell-bent on getting photos, don’t bother with the camera. Hey! Thank you so much for featuring us on your website. I’d love to address some of your concerns. 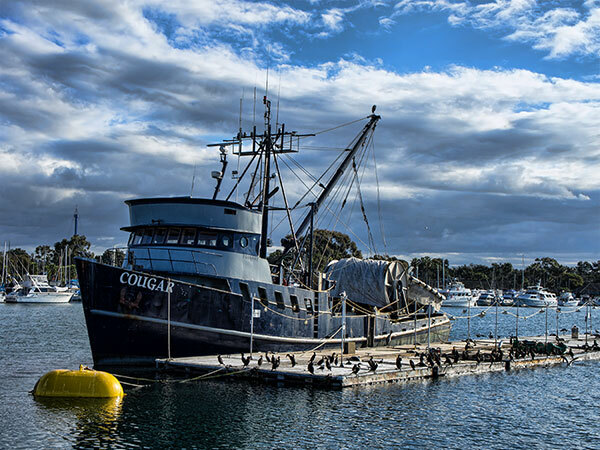 The Marine Life Protection Law does require us to idle our engines when we get within 300 yards of marine wildlife, to prevent boat strikes as well as prevent stress to animals, which could easily harm or kill them. 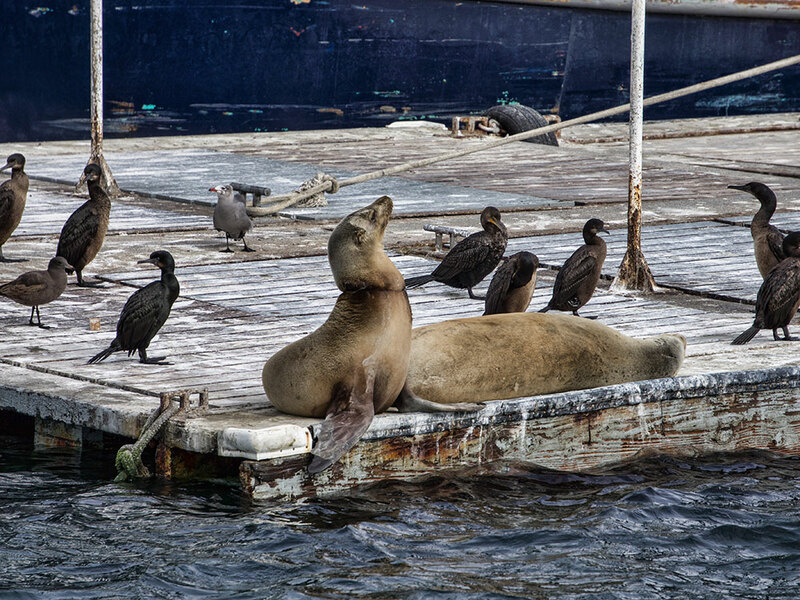 However, many times the animals do end up approaching our boats out of curiosity. This is a very common event and I apologize for not being able to deliver that to you on your trip! In regards to the fuel surcharge, Groupon, Travelzoo, Zozi, Spreebird, Living Social, etc, can not charge taxes and fuel on their vouchers. All of our companies are supposed to make this clear on their vouchers, but, unfortunately, a few of them put it in the very fine print or say that the fuel surcharge “may” apply, which is misleading to our customers. I apologize if this was not made clear to you and we take full responsibility. 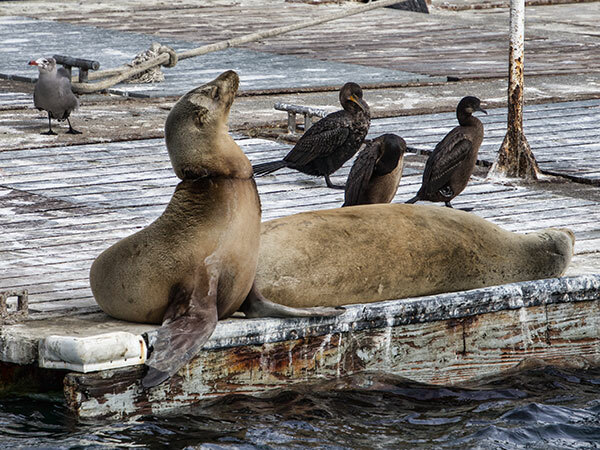 I do have to thank you for taking the picture of the female sea lion. It seems as if she has something strangling her neck and we sent this over to the Sea World Rescue group. 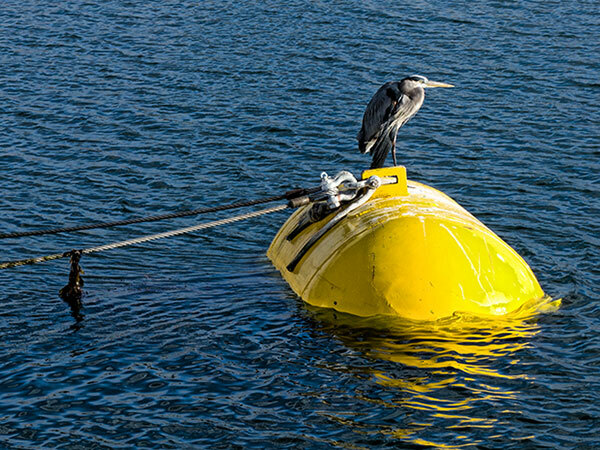 Hopefully, it is nothing but a trick of the camera, but if it isn’t, Sea World Rescue are a great group that have saved numerous marine life from getting tangled in fishermen’s wire and might be able to help her out. I am glad you enjoyed the dolphins and being out on the water, in general. If you have any more concerns, please call or email us. I’d be more than happy to assist you. Thanks! Thanks for the explanations. 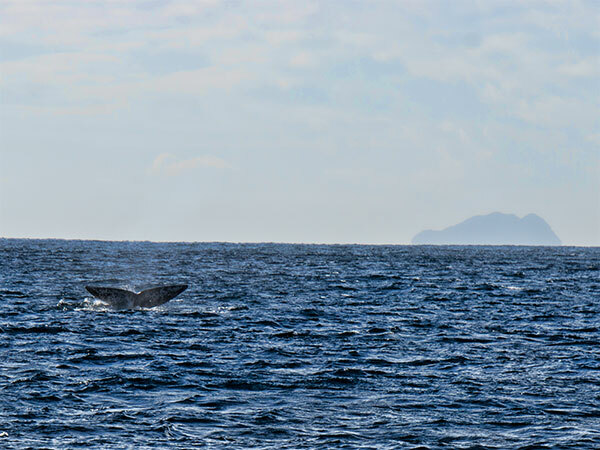 To be fair Pacific Nature Tours did a good job – the boat was clean and safe; the employees were all very friendly, knowledgeable and seemed to genuinely care about the whales and wildlife around us. Perhaps what I wrote was a little too negative – I’m sure the bad weather contributed, and if I hadn’t been so determined to get pictures and just watched instead it would have been more enjoyable.